What does it really mean to be "post-digital" in architecture? - Archpaper.com What does it really mean to be "post-digital" in architecture? What does it really mean to be "post-digital" in architecture and beyond? MVRDV's Glass Farm (Courtesy MVRDV). I don’t go on Facebook much these days. It’s not out of protest (my disinterest precedes their recent election debacle). I simply prefer Instagram for the short bit of scrolling and swiping I partake in daily (something about the smooth stream of vivid pixels appeals to me). I do, of course, talk to Facebook users, so when a recent debate broke out on the social media site around Mario Carpo’s Metropolis essay, provocatively titled “Post-Digital ‘Quitters,’” I went to check it out. After skimming the comments, I read the article, which left me a bit troubled. There are parts of it that I agree with, such as the need for architects to consider the profound effects of technology at every turn, but on the whole Carpo’s definition of “post-digital” could not have been further from my own. As someone who writes on the topic and believes it to hold significant value for contemporary architectural discourse, I think it’s productive to offer up some clarifying thoughts. So, consider this a definition of sorts, for the record, of what “post-digital” means and why I think it’s worth discussing. Note, I don’t believe mine to be the only definition floating around out there, so I encourage others to join the debate. For me and my colleagues, however, the following holds true. The most common misconception of “post-digital” is that it signifies “beyond,” “anti-,” or simply “not” digital. Nothing could be further from the truth. The post-digital is deeply digital; it simply recognizes our current moment to be different from previous periods of digital preoccupation. When digital design discourse began in architecture (what Carpo calls “The First Digital Turn”), functions like computer processing and network connectivity were limited to discrete objects, such as personal computers. Now they course through devices of all shapes and sizes, affecting nearly everything we do as architects—how we labor, what that yields, and how our work is disseminated, received, and by whom. Think of the post-digital like the post-apocalyptic, a cataclysmic event (the digital revolution) that conditions everything that comes after. A discursive analog might be post-feminism, where the core tenets of a discourse are debated and adapted to keep pace with the times. Architecture has a tendency to see “The Digital” as a fixed category, rather than more appropriately as an entity in flux, in need of constant interrogation and qualification. Scholars of digital design (Carpo among them) tend to concern themselves with the few progressive pioneers who challenge architectural norms through radical experimentation with new tools. This made sense in the 1990s, when computers were rare, expensive, and few knew how to use them. But today, everybody uses computers. And the mundane activities of daily digital life (Photoshop filters, 3-D libraries, Google image searches, etc.) are arguably as important as the most technically sophisticated work with machines (AI controlled robots for example) as they affect more people. Our current digital situation is broad and cultural, perpetuated by the daily habits of ubiquitous computing. Though pervasive, habitual digitality has largely gone untheorized in architecture. If our discourse remains focused solely on exceptional cases, we will miss the profound effects that digital technology has on the vast population of “users” defining the built environment. Digital design is no longer a rarified practice of experimental vanguards, it’s a mainstream cultural practice worthy of our attention. As an aesthetic, the post-digital stems from the saturation of digital technology to the point where it becomes an image. Once relegated to screens, digital characteristics (pixels, gradients, filters, and the like) are quickly becoming fixtures of the physical world. 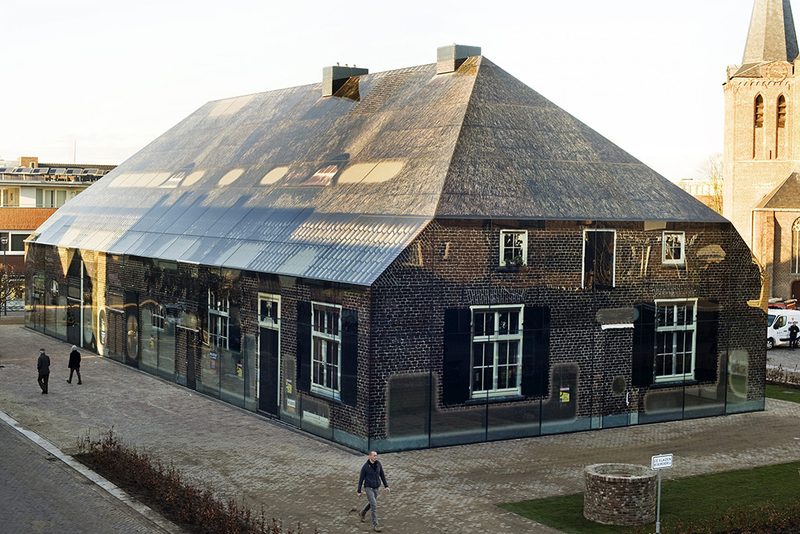 Take MVRDV’s Glass Farm for example, a building covered top-to-bottom in digital imagery. Three details strike me as particularly post-digital about this project. One, the imagery comes from a digital “original” that was created by averaging data derived from farmhouses in the area (why not just use photographs of the farmhouses?). Two, the imagery is printed at one and a half times the size of a typical farmhouse (a nod to the plasticity of scale native to digital mediums). Three, the imagery is selectively removed to produce apertures in a manner reminiscent of Photoshop commands (is the fuzzy boundary the result of decreasing the “hardness” of your brush?). Glass Farm seems to say more about the naturalization of software than conventional tectonics. When software shows up in buildings, when it assumes the status of common sense or a verb (Is that Photoshopped? ), architects should take notice. Current digital design discourse, with its focus on form-generation and fabrication, tells us little about projects like Glass Farm, signaling the need for new conversations concerning computation. Post-digital in sensibility, such conversations will differ from those we have known. The fervor and futuristic tenor of early digital experimentation will give way to a more measured tone, one focused less on novelty and more on the hidden aspects of computation. Post-digital design discourse calls for a critical examination of the tools and technologies we take for granted, while simultaneously connecting what we do to larger cultural shifts occurring globally. This is about more than design. Computational structures establish not only the grounds of architectural production, but increasingly life itself. Today we face an ecology of digital media that affects us aesthetically, but also socially, politically, and ontologically. Tuning architectural design and discourse to the changing contours of computation will better position us to impact our increasingly mediated world.